Those of you that are frequent readers of thefraternityadvisor.com realize that I am a veteran. I served for 5 years in the military, which included two deployments to the Middle East. I am currently the fraternity president. At the moment the fraternity seems to be ripping itself apart. 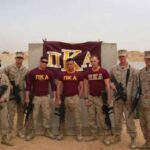 We are the smallest we have ever been and we have some very strong personalities in the fraternity who think they are right and everyone else is wrong. The school I’m at now didn’t have a chapter, so I tried starting one myself. It wasn’t even my idea at first, but my friends started the idea in the fall of 2011 and were down to start a chapter with me. I thought it would be a great opportunity, but this past year I’ve been a one man team. Most fraternities claim to be very selective during recruitment. However, that often isn’t the case. In the eternal quest for numbers, a fraternity will rush anybody and everybody to try to get a huge new member class. In the long run, this could cripple your new member class and fraternity. Fraternity and Sorority mixers are one of the great things about being Greek. Here are a few great ideas that I have experienced. I am an Asian student at school in Texas. I am going to be a junior next year and I have decided to rush in the fall of 2011. I do not wish to rush my university’s multicultural Asian-interest fraternities but an “IFC” one instead. 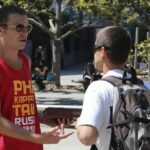 Eventually, during every recruitment, the fraternity conversation happens. It happens at different times for different people. The people that are truly interesting in joining a fraternity will ask the questions that all fraternity men have asked. When they ask you these questions, you have to be prepared to answer them. Fraternity brothers have disagreements. It is perfectly natural for that to happen whenever you get a bunch of headstrong guys together. Having a golf tournament as a fundraiser is a way to have a great time and fund-raise a lot money for the fraternity. My first rush period as an initiated brother was good. I brought out a few guys who would become good brothers. However, that class had an opportunity to be great, but I dropped the ball. A fraternity is throwing away money if they don’t take advantage of recycling cans. This is the perfect fundraiser for a new member class.